Mary is the coordinator and a founding member of Mamma’s Laef, a social enterprise run by six ni-Vanuatu women in Port Vila. 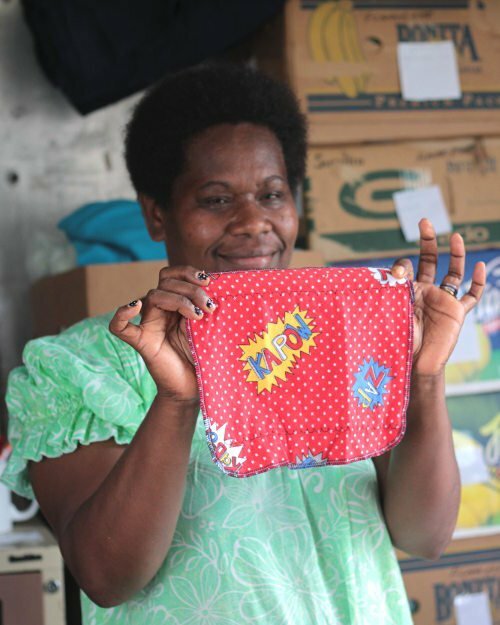 Mamma’s Laef sew washable sanitary pads that they distribute to communities across Vanuatu, where women often do not have access to menstrual hygiene management products, instead using old cloth or other unreliable and unhygienic substitutes and missing days of work and school as a result. “I wish that one day that all mothers will use our products and it will reduce sickness and they will spend less on disposable pads. I want our daughters to be able to go to school and not have to come back home because she doesn’t have any sanitary products to use” explains Mary Kalsrap. Mamma’s Laef also runs awareness sessions in schools to teach girls about puberty and the reproductive system, helping to tackle a lack of factual information about how the body works and break down damaging stigma about menstruation. Mary is passionate about helping girls access the resources and information they need to manage menstruation and live their lives to the fullest. This portrait of Mary Kalsrap Rolls was first published by the Pacific Community for the 70 Inspiring Women campaign, it is reproduced here (with some modifications of our own) with their permission.